I like your tomatillos – Goat anyone? Yesterday I walked to the farmer’s market; 10 miles round trip. It’s held in the parking lot of the neighborhood Episcopal Church where I attended this morning and discovered and that in the five years they’ve hosting the market, yesterday was record attendance: 5000, which seems to have some biblical resonance. Unfortunately, what I discovered was that these weren’t small-scale organic farms featuring heirloom varietals. Rather, each stall featured the exact same produce that I’m pretty sure came off the same truck that was heading to the Publix up the street. After walking up and down the parking lot a couple times, I keyed in on some tomatillos. Salsa Verde! I edged my way to the front of the table and informed the proprietor that I liked her tomatillos. We discussed salsa verde and she threw in a couple habeneros to help me along. 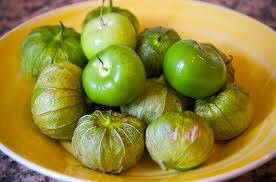 Those tomatillos formed the inspiration for three meals this week (recipes follow). Bring to a simmer flavorful water (evoo, garlic, cilantro, salt, pepper, bay leaf, etc). Place fish filets into simmering water until opaque and flaky. Serve over rice with salsa verde, tomatoes tossed in evoo.